Traditional silt fence is a small system within a bigger system. 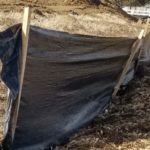 Understanding how silt fence is a system, and is part of a system can lead to better choices for your project. And by better we mean more effective Best Management Practices (BMPs) at a lower total cost. How is silt fence a system? Traditional silt fence is a system because several interdependent things must happen the right way to ensure the results we want. Specifically, silt fence depends on good design (the location and use of the fence), reliable materials, and installation practices that are consistent with the design. An example or two will help make this clear. 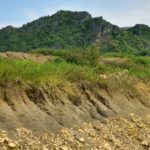 First, silt fence is intended to be installed at the bottom of slope and on the contour. This allows it to intercept and prevent sediment from leaving your project. And because it is intended to be a structural barrier, any installation faults that weaken the structure will cause limited effectiveness and possible failure. In short. If it is not built right and placed correctly, it won’t work right. Secondly, if silt fence depends on materials and attention to installation details, then any poor choices in the installation can cause failure. For example, if the bottom of the fabric is not locked into a trench, then surface water can get beneath it, defeating the purpose of the fence. Likewise, fabric that photo degrades too quickly or a lack of staples to hold the fabric to support stakes will lead to surface water passing through weak spots in the fence. If water is passing through, then sediment is almost certainly going with it. These factors must all be completed correctly to avoid a system failure. Any one of these items done poorly becomes the weak link in the chain. How is D-Fence a Better System? 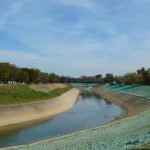 D-Fence is designed to address the most common points of silt fence failure and consistently produce a sediment control barrier that reliably performs as intended. D-Fence is reinforced at several points to ensure longevity. Staples, stakes, fabric and the trenching method are all optimized to create effective barriers. So the D-Fence system avoids weak links and can perform its design function as part of a larger system. Why is this important to your project? D-Fence as part of a Larger System. For many years, even decades, the EPA and state and local regulators have recognized sediment control barriers as an effective way to keep sediment and other pollutants out of our shared waterways. And for just as many years, the EPA has been recommending that site do not rely solely on sediment control, or a single point of control. So redundancy and the use of both erosion control and sediment control are considered best practices. Other practices like construction entrances, sweeping, management of pollutants and others are all part of a well-designed system. Even scheduling choices and decisions about where to locate stockpiles can be part of the larger stormwater compliance system. But when traditional silt fence is treated like a throwaway item and when poor quality silt fence becomes the standard, then the overall stormwater system has a consistent weak point. Silt fence has in many cases become the weakest link, so that failure of the silt fence often means the failure of the overall pollution control system. D-Fence, due to its longevity and effectiveness, can fix that weak link and restore the functionality of your overall system. Does that seem like too strong a claim? Consider what happens when silt fence fails. Not only will you have a finding on your inspection report, and the costs of scheduling, directing, and paying for repair, but in the time until the repair is done, you are more prone to have sediment leaving your project. This multiplies the impact of your weak link since street sweeping and inlet cleaning will greatly increase your project costs. Beyond the cost of your efforts is the potential impact to Colorado’s waterways. Considering all the negative impacts of failed silt fence, isn’t it time for a better solution? Let D-Fence replace the weak link in your stormwater compliance chain and enjoy the benefits of a fully operational system.